Mauricio Pochettino felt Tottenham were deserving of all three points despite needing Hugo Lloris to save a stoppage-time penalty in Saturday's 1-1 draw against Arsenal. Having fallen behind to Aaron Ramsey's early goal, Spurs equalised through Harry Kane's spot-kick, although the striker looked to have been offside in the build-up to the award. It looked as though Pochettino's men would fall to a third straight Premier League defeat for the first time since 2012 when Pierre-Emerick Aubameyang went down under minimal contact from Davinson Sanchez in the box, but the Gabonese's weak effort was kept out by Lloris. Regardless of that late escape, Pochettino believed his side were in the ascendancy and should have emerged victorious. "I think if you assess the game I think we were better than Arsenal in all aspects, but of course in the way that it finished, with the penalty missing by Arsenal [it could have been different]," the Argentine told a news conference. "I think it was a fantastic game, such an exciting game, great atmosphere with two teams who wanted to play and win the game. It's always tough to play against Arsenal. It was tough because to concede after 15 minutes was tough for us. "But of course I am so happy with the character, the personality and the way that in the end we played. It wasn't great, our performance, but it was very good to draw and then maybe deserve to win. After two defeats [to Burnley and Chelsea] it was important today to build again our positive ways." 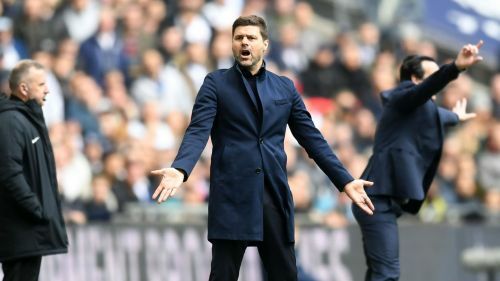 Pochettino bemoaned an early Granit Xhaka tackle on Kane that went unpunished, while he hopes next season's introduction of VAR will help to eradicate some of the perceived injustices against his side. "The action that changed the game was the Xhaka challenge on Harry Kane that wasn't even [given as] a foul. That changed the dynamic of the game. We've been unlucky with decisions this season," he added. "Football never was fair and it never will be. But of course in the way that we are going to use the VAR is going to be key. It's going to try to be in some situations fair decisions for each."